Hertel Bathroom Disinfectant contains La Parisienne Bleach and is specially formulated to kill germs, viruses, funguses, as well as germs causing mould, mildew and bad odours. It removes tough stains and disinfects, while leaving a fresh, clean scent. Phosphate-free, Hertel Bathroom Disinfectant with Bleach is ideal for getting rid of germs, mould and mildew on toilets, bathtubs, sinks, shower walls and doors, grout and ceramic tiles. It is recommended that you wear rubber gloves when using Hertel Bathroom Disinfectant with Bleach. Avoid all contact with clothes, fabrics, wood, aluminum and carpet, since Hertel Bathroom Disinfectant contains Bleach that can discolour these items. In case of splashes, rinse immediately. Spray the surface, rinse and wipe with a damp cloth or sponge. To disinfect hard, non-porous surfaces, spray Hertel Bathroom Disinfectant with Bleach and let it stand 10 minutes before wiping. Heavily soiled areas must be cleaned before they’re disinfected. Any surface that may come in contact with food or is within the reach of children of mouthing age must be rinsed following disinfection. 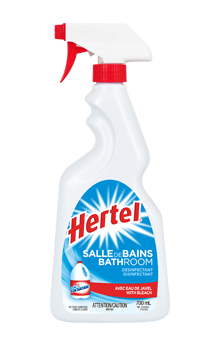 Use Hertel Bathroom Disinfectant with Bleach to clean the dirt, mould and mildew that sometimes build up between ceramic tiles. Clean grout makes them look almost like new! Moisture stains on the bathroom ceiling? Use Hertel Bathroom Disinfectant with Bleach to eliminate them. It is best to spray the product on a cloth and wipe the ceiling instead of spraying the surface to prevent the product from dripping on you. To effectively clean an acrylic bathtub or shower, use Hertel Bathroom Disinfectant with Bleach. It will leave it looking bran new!